last night i decided i needed to actually make something for my brown bags this week at lunch. i don’t mind eating out, but it gets old quickly when you have a limited window for it. i rummaged through my recipe box, looking particularly for something that i hadn’t yet tried. a few soups looked tasty, but i need it to be slightly cooler before i get those brewing. 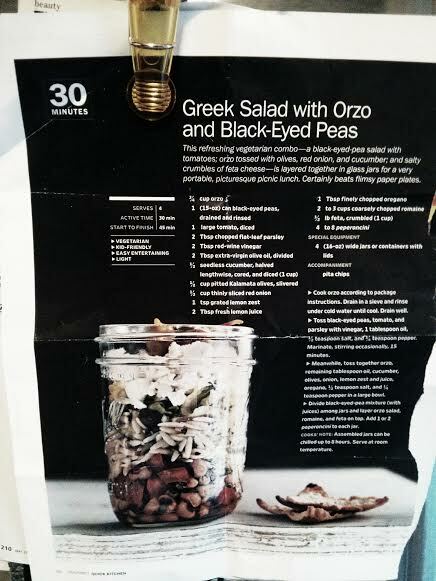 i came upon this recipe for greek salad with orzo and black eyed-peas, clearly ripped out of the pages of an old real simple magazine from years ago. although i didn’t have mine fashioned in these stylish and hip mason jars, my tupperware containers suited them just fine. enjoy! cook orzo according to package instructions. drain in a sieve and rinse under cold water until cool. drain well. toss black-eyed peas, tomato, and parsley with vinegar, 1 Tablespoon oil, 1/2 teaspoon salt, and 1/4 teaspoon pepper. marinate, stirring occasionally, 15 minutes. meanwhile, toss together orzo, remaining oil, cucumber, olives, onion, lemon zest and juice, oregano, 1/2 teaspoon salt, and 1/4 teaspoon pepper in a large bowl. divide black-eyed pea mixture (with juices) among jars and layer orzo salad, romaine, and feta on top. add 1 or 2 pepperoncini to each jar. *note: assembled jars can be chilled up to eight hours and serve four. enjoy at room temperature with pita chips. **kelsey’s note: i assembled my tupperware this morning before work and had it as a salad for lunch.